Spray 3- to 4-quart slow cooker with cooking spray. In cooker, spread 1 can of the green chiles. In medium bowl, mix remaining can of green chiles, the soup, enchilada sauce and mayonnaise. Arrange 1/3 of the tortilla strips over chiles in cooker. Top with 1 cup of the chicken, 1/2 cup of the beans, 1/2 cup of the cheese and 1 cup of the enchilada sauce mixture, spreading to edges of cooker to completely cover tortilla strips. Repeat layers twice, reserving last 1/2 cup of cheese. Top with remaining 1/2 cup cheese. Cover; cook about 5 minutes longer or until cheese is melted. Serve with tomatoes, lettuce and sour cream. Rotisserie chicken works well for this recipe. Just remove the skin and bones, and shred the meat with 2 forks. One average rotisserie chicken yields about 3 1/2 to 4 cups cooked chicken. Red enchilada sauce can be used. It will give a pink tint to the finished recipe. You could serve this recipe with tortilla chips as an appetizer. When Mexican night rolls around, these slow-cooker chicken enchiladas are the perfect dinner option. We love using yesterday’s rotisserie chicken to make the recipe extra easy, but even if you haven’t got cooked chicken on hand, this is a seriously simple dinner. Try it out on a weeknight when you want to come home to dinner already made in your slow cooker, or throw it together on a lazy Sunday. If you have a big fiesta ahead, serve this recipe with tortilla chips for an easy app. Looking for a beef or vegetarian enchilada recipe? 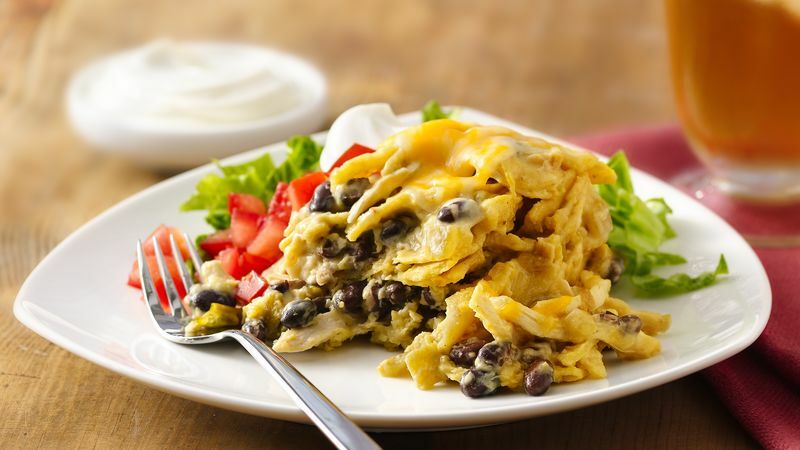 Check out the rest of Betty’s enchilada recipes.